Goma is a fire ritual performed in esoteric Buddhism to lead people to a spiritually higher realm. It is performed daily in the Main Hall of Yakuo-in. The priest performing the goma sits at a platform that contains various ritual implements and has a brazier in the center. He casts small wooden sticks, which symbolize people's defilements, into the purifying fire. The priest and those participating in the ritual all become one in body, speech and mind with Izuna Daigonen. The deity's wisdom purifies the defilements and, extinguishing all illusions, opens the path to enlightenment. The purified prayer-requests, written on the goma sticks that have been cast into the flames, are said to be have been fulfilled when they rise through the leaping flames to the heavens where Izuna Daigongen dwells. Participants receive wooden tablets called gomafuda, which are considered to be incarnations of Izuna Daigongen. They are taken home with great care and enshrined in a prepared place, and devotees chant the mantra "Namu Izuna Daigongen" (I place my faith in Izuna Daigongen) before them with deep dedication. 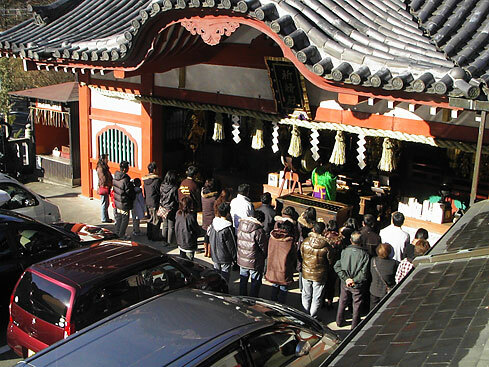 Prayer-rituals for the safety of drivers and their cars are performed at the Kito-den Hall.